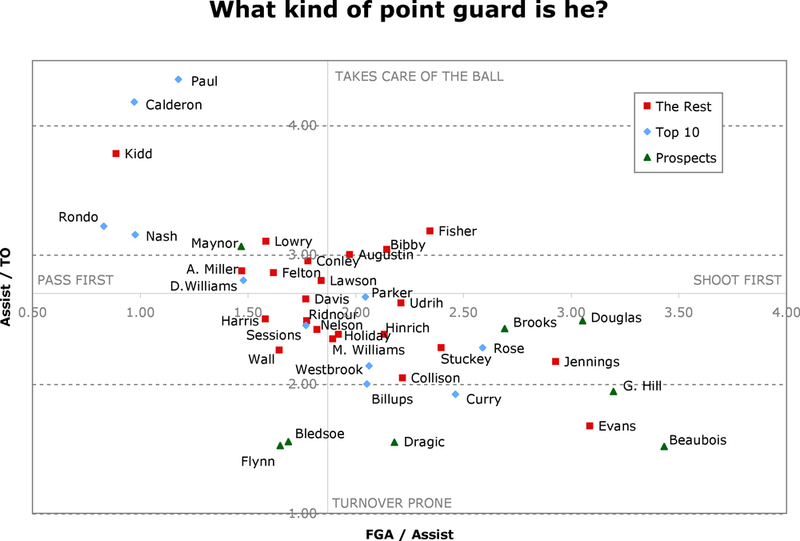 My post from a few days ago was relatively well-received at reddit, and one of the readers there said that he’d like to see the same graph for some of the all-time great point guards. So with a little help from Basketball-Reference.com, I compiled a list of (all?) the Hall of Fame point guards: Oscar Robertson, Lenny Wilkens, Bob Cousy, Jerry West, John Stockton, Isiah Thomas, Magic Johnson, Dennis Johnson, Tiny Archibald, Calvin Murphy, Pete Maravich and Walt Frazier. Unfortunately, the NBA didn’t start keeping track of turnovers until the 1977-78 season, so there’s no assist-to-turnover data for the first four (Robertson, Wilkens, Cousy, West) and the data for Archibald, Murphy, Maravich and Frazier is incomplete, so I could only use their post-1977 numbers. I also compiled a list of the top non-HOF point guards who are both retired and still active: Jason Kidd, Mark Jackson, Steve Nash, Gary Payton, Rod Strickland, Maurice Cheeks, Terry Porter, Tim Hardaway, Andre Miller, Muggsy Bogues, Kevin Johnson, Derek Harper, Stephon Marbury (yes, Stephon Marbury), John Lucas, Norm Nixon, Mookie Blaylock, Sam Cassell, Avery Johnson, Baron Davis, Nick Van Exel, Allen Iverson, Chauncey Billups and Mike Bibby. All of these players have at least 5,400 career assists, which seemed to be the cutoff for players I was interested in using for this study. Lastly, I added seven of the top current point guards who have yet to break the 5,400-assist barrier: Tony Parker, Stephen Curry, Russell Westbrook, Rajon Rondo, Derrick Rose, Deron Williams and of course, Chris Paul. What kind of point guard is he? We hear it all the time. NBA analysts call one point guard “pass-first” and another “shoot-first.” Or they say one guy is “turnover-prone” while another “takes care of the ball.” But really, what makes a player a “pass-first” point guard? How carefree must he be with the ball to be considered “turnover-prone”? I first tackled this subject two years ago, and settled on the shot-to-assist ratio to determine whether a player is “pass-first” or “shoot-first.” The higher the number, the more of a “shoot-first” player he is. To determine whether or not a player is “turnover-prone,” I calculated each player’s assist-to-turnover ratio. The higher the number, the better the player is at taking care of the ball. So the pass-first/shoot-first aspect goes left to right, and the turnover-prone players will be towards the bottom, while the guys that take really good care of the ball will be up top. Players indicated with a blue diamond are in the Top 10 in this group in Efficiency Per Minute. I set the axis for each category at the average of the 33 players in question, so 1.97 for FGA-to-assist and 2.70 assist-to-turnover. Two years ago when I conducted this study, seven of the top 10 EPM performers were in the top left quadrant (pass-first, takes care of the ball). This year, only five of the top 11 (I included both Rondo and Calderon, since they tied for #11) are in that quadrant. This is due to the emergence of three shoot-first, (fairly) turnover-prone guards who are emerging as stars: Derrick Rose, Russell Westbrook and Stephen Curry. While the vast majority of NBAers are in Los Angeles for the All-Star Game or at home enjoying a few days off with the family, newly-single Tony Parker was in Las Vegas for a party at LAVO. Here are a few pics. The couple was at sold-out Red Bull Arena last night in Harrison, N.J., to watch their friend Thierry Henry and the Red Bulls lose 1-0 to the L.A. Galaxy. The Knicks’ dream would be to acquire Carmelo Anthony and Chris Paul, but unless Paul forces a trade, the earliest he could sign outright would be the Summer of 2012. Parker wouldn’t be a bad backup plan if it looks like Paul is going to stay put in New Orleans. Parker will be 29 next summer and has had trouble staying healthy. He has missed 49 games over the last three seasons. He definitely has the speed to run D’Antoni’s system, though I don’t know if he has the vision. He has never averaged more than seven assists per game, and isn’t the traditional pass-first point guard. However, if he’s the third wheel behind Melo and Amare, I’m sure he would adjust. It’s just that Stoudemire is so good on the pick-and-roll and Parker isn’t the greatest passer in those situations. Parker just has one year left on his contract and will be a free agent next summer. Knicks’ front office fractured over Carmelo talks? Carmelo forcing his way to Knicks?